Our Tribe Gratitude shop is filled with a lot of inspiration and a whole lot of intention to empower women of every age. The vision for our new line of Tribe Gratitude hand-knotted Goddess Necklaces was inspired by an Indian Prayer Mala, where each bead becomes your own meditation moment or mantra, your own brand of empowering intention, or just simply the luxury of feeling goddess-like as you wear our semi-precious stone, pearl or crystal heart necklaces. 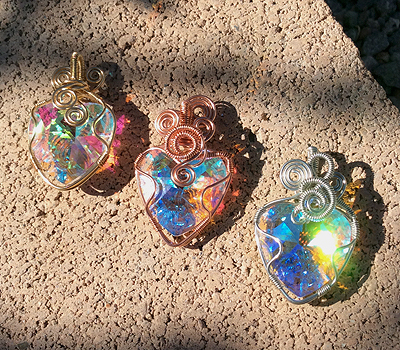 The pendants on each Goddess Necklace are a crystal gratitude heart, semi-precious stone, or quartz point pendant that will amplify energy, bring clarity to your thoughts and intentions and surround you with protection from negative energies. The hand-knotted necklaces are long lengths that can be doubled up and worn lariat style or hang long for a sophisticated boho look. Our Signature Tribe Gratitude Hearts are wire wrapped by Valohna personally. The inspiration behind the gratitude heart is to remind every woman that she is beautiful, whole and complete at any age. 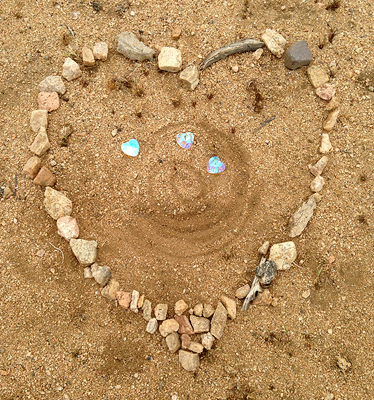 Our product line of aurora borealis cut-crystal hearts are designed to encourage women to stand in their power. Our hearts will foster human connectedness and invite interaction, so shine bright with the attention! Tribe Gratitude Hearts are presented on a simple chain that matches the wire wrapping of the heart. Custom-designed pendants and chain length customization are available. You can also custom order a smaller version of any of our Tribe Gratitude Hearts. Simply contact us with your request. As we all awaken to our inner light we are led to be bold so that others can also believe in their own light. This powerful large crystal necklace is a beautiful spiritual adornment for any goddess in meditation or in service to others. Each crystal is different because it is a natural stone. We make every attempt to recreate the design as close as possible to the picture on the website. 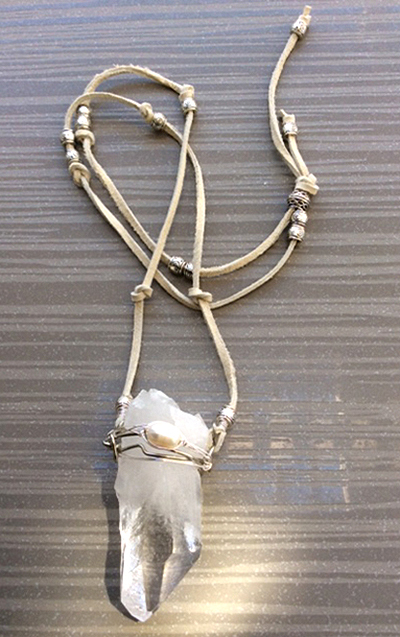 The Temple Crystal Necklaces are one of a-kind and created by Valohna, personally. Each is given a sacred ritual to positively charge it for its new owner. Delivery: 2 weeks or less. This powerful combination of feminine pearls and silver tone Bali beads strung on a leather thong is a perfect gift for the woman who is embracing her courage and the strength to step into her mastery as a visionary and Being of Light. The Strength Lariat is a wrap necklace that can also be used as a wrap bracelet, which makes this versatile accessory a sweet addition to your wardrobe of Goddess armor. The Shrine Necklace was created to remind you that you are your own priestess. 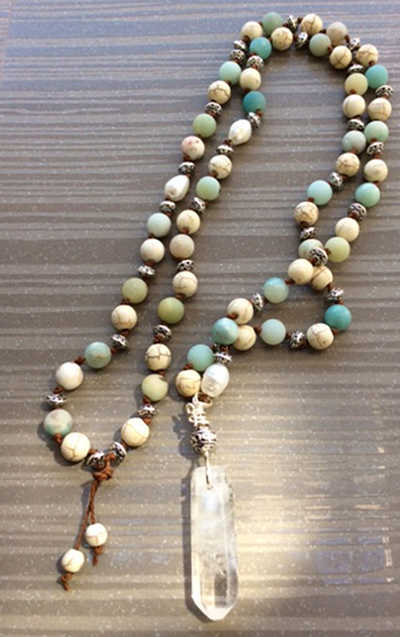 This sacred necklace is a great meditation piece that can be used much like a mala when you wish to be centered. Each knot is your own mantra, each bead is a wish or intention. You will come to love this necklace as a special talisman and beautiful personalized accessory that is so much more than a piece of jewelry. It is a statement to the world that you are a light bearer. 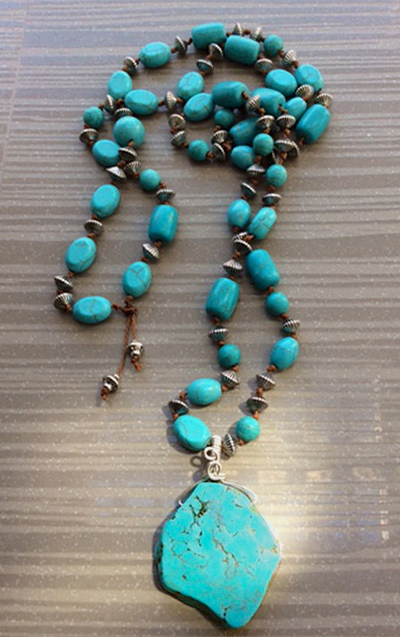 The Tribe Necklace is made from howlite that is dyed a beautiful turquoise color. The intention behind the Tribe Necklace is to feel connected to your friends, the earth and the stone. Howlite is the stone of attunement , which links the user to higher forms of consciousness. It reduces anxiety, tension and stress; it encourages awareness and emotional expression; and it assists with the release of pain and will calm and soothe the emotions. Being with tribe achieves the same feelings, but when you can’t be with your tribe, our necklace is the next best thing. Amazonite is a healing stone that aligns you to your life purpose and encourages you to step onto a path with strength and courage. It assists you in ﬁnding the divine truth in all things and facilitates a deep internal reﬂection. It will encourage you to come into alignment with your divine will and manifest your heart’s desires. We team this with howlite, which links you to your higher consciousness, so you have a powerful accessory that will work for you in positive ways. In today’s world it makes sense to seek balance. Let our Balance Necklace from Tribe Gratitude be your friend and take you places. 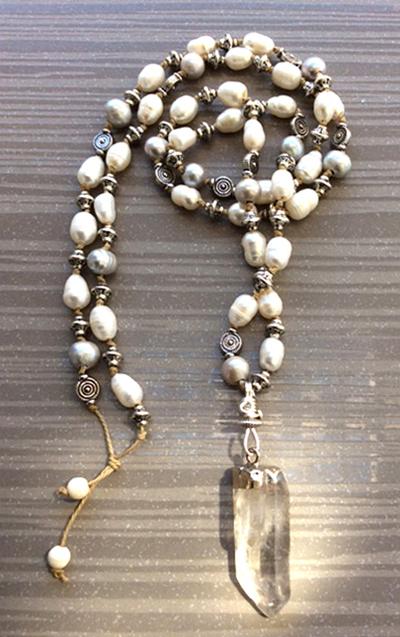 The beauty of pearls and howlite, teamed with a quartz crystal point, is one of our signature necklaces. Pearls or “charms of light,” are known to enhance purity, innocence, honesty, integrity, concentration, focus, meditation, tranquility, and wisdom. Pearls are at home in the 3rd eye chakra. 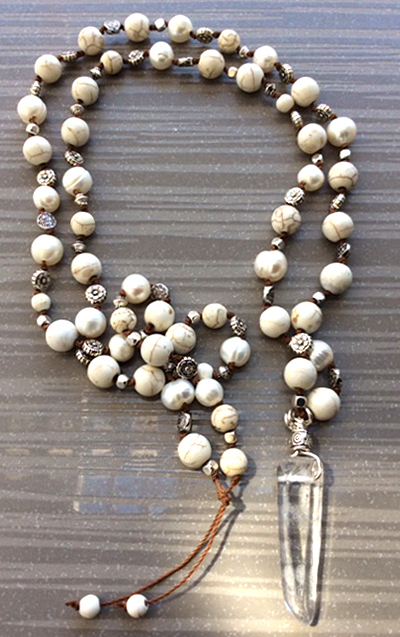 Howlite focuses on attunement of these qualities, and quartz magniﬁes the power of this beautiful combination. 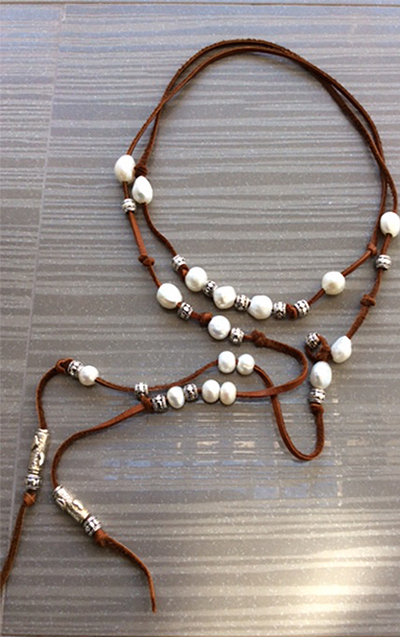 We have added Bali beads for an old world feel. The Tranquility Necklace can also can be used much like a mala where each knot is an intention and a tool for meditation or personal transformation. 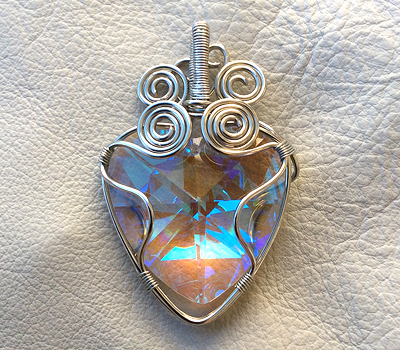 The inspiration for the heart design was a conversation at the Shakti Festival with a woman who emanates love named Marjan who commited to a life shift and emerged whole and complete. When you desire to make a life shift the gratitude spirals will create the energy to assist you in making choices that serve your highest good. Go Ahead..Be the woman you are destined to be. Available in the following colors: silver, gold, copper, and bi-metal silver and gold. The Shakti Heart is presented on a simple chain that matches the wire wrapping of the heart with with matching hand crafted wire wrapped hooks. The flow heart is inspired by the act of being the observer, where gentle swirls and long lines of hand wired craftsmanship create a mandala that will remind you to breathe and go with the flow of all things. Opposing gratitude spirals remind us of the process of coming and going, giving and receiving, letting go of pictures and following an unexpected path where all is revealed. The flow heart is here to remind you to be gentle and to remind others that they too can Be in the flow of life. Available in the following colors: gold, silver, copper, and bi-metal silver and gold. The Flow Heart is presented on a simple chain with matching hand crafted wire wrapped hooks. The gold gratitude heart design represents that feeling you get when you are in a quiet place of thankfulness. We call that “Being Gratitude”. Made with multiple gratitude swirls that are hand wound craft wire and stacked high in this design, consider them little meditation swirls that honor your journey and your current awareness. Some consider it a meditation piece that was inspired by peaceful moments We just love the way it makes us feel heavenly. Available in the following colors: gold. The Gold Gratitude Heart is presented on a simple chain with matching hand crafted wire wrapped hooks. Throughout Palm desert we get warm high winds that blow across the desert floor. There is no way you can not be affected by them. They can be gentle and quite fierce and show up unexpectedly, and in that moment we can choose to resist or release. 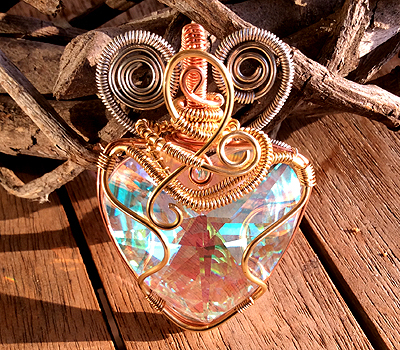 The wind gratitude heart design is inspired by becoming one with the wind by letting it in and breathing with it and allowing it to work its magic on your soul. 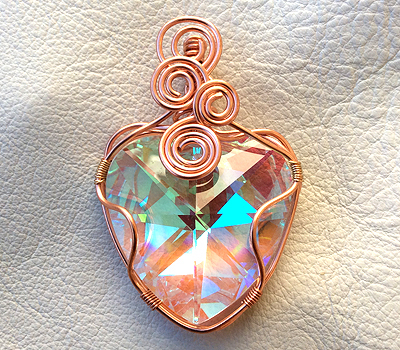 Made of copper craft wire this design is a reminder to release your resistance..let life blow thru. Available in the following colors: copper. The Wind Gratitude Heart is presented on a simple chain with matching hand-crafted wire wrapped S hooks. This heart creates energy where ever it is seen. Copper and gold infinity spirals that are hand woven remind us that love is at the center of all that is. Inspired by the interwoven experiences of life in synchronicity, this design was born on a sunny morning in Palm Desert California and was received with love by a dear friend. 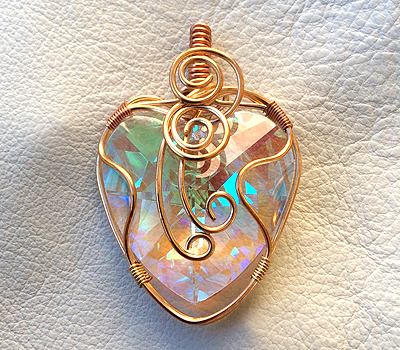 Made of copper and gold craft wire that is hand wrapped and woven together the heart will attract many conversations so be ready for human interaction this is what it is all about. Available in the following colors: Bi-metal copper and gold. 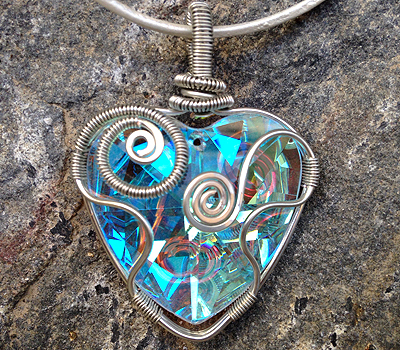 The Infinity Spiral Heart is presented on a simple chain with matching hand wired S hooks. The Owl Gratitude Heart is our signature heart and is designed to empower, support and Remind us to Be our highest self. Our bi-metal design is made from Gold and Silver craft wire the design ignites the duality of who we are. 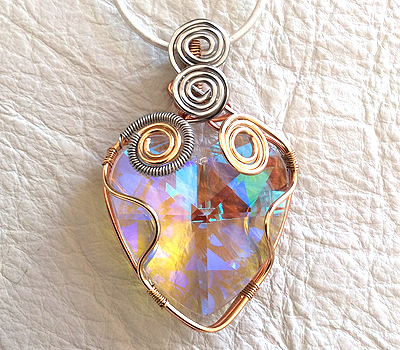 The texture of hand wrapped gratitude spirals combined with slim wire spirals encase this heart of many colors and embolden the owner to speak their truth. Available in the following colors: Bi-metal gold and silver. The Owl Gratitude Heart is presented on a simple chain with matching S hooks. The Free Form Gratitude Heart is created with pure flow. Each heart in this category is different yet similar in style to what is pictured here. This heart design is inspired by the connection between the buyer and myself. If you tell me a little bit about yourself, I will create a heart that will support your dreams. Made of craft wire that is hand wrapped and swirled at random this heart is sure to delight you when you receive it, knowing it was designed exclusively for you. Available in the following colors: Silver, copper, gold, and bi-metal silver and gold. The Free Form Gratitude Heart is presented on a simple chain with matching hand wired S hooks. 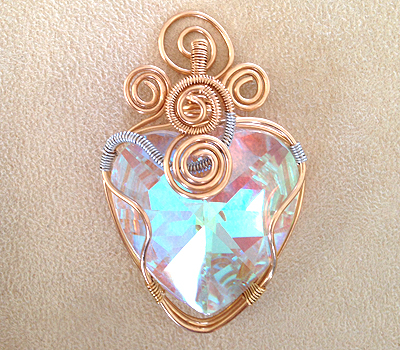 This heart was inspired by girlfriends in dramatic life transition. The design is inspired as a form of female armor so that as your life shifts you are protected by the goddess. Made of silver craft wire the shift is pounded, wrapped and released into the world to guide you thru your transition and inspire you to boldly speak your truth. Available in the following colors: Silver. The Shift Gratitude Heart is presented on a simple chain with matching hand wired S hooks. Dramatic wire work is the signature look of our Tribe Gratitude Angel Armor. 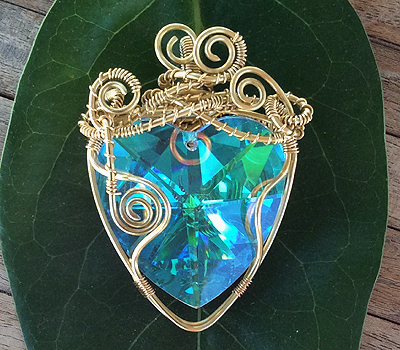 Each piece is designed with inspiration taken from nature to empower the soul. All designs are ever so slightly different as Angel Armor is a custom inspiration from Valohna for the person who purchases it. 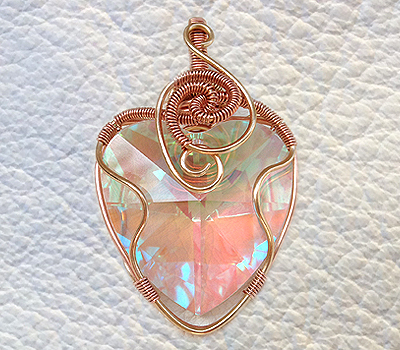 Custom piece available in the following colors: Silver, copper, gold, and bi-metal silver and gold. 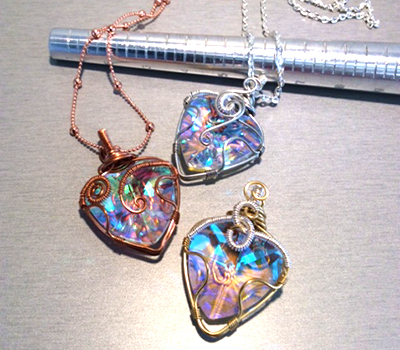 This trio of hearts is designed to be given as a talisman to connect the heart and soul intention of women or dear friends. Each heart comes with a free flow design that is inspired by the story you may wish to share with me regarding your tribe of girlfriends. You may wish for me to create one design that you all wear, if so we will work with you, it is up to you when you buy this fun package as we engage together to create something special for your tribe. The tribal sisters heart is our smaller heart which measures 1- 1/4 x 1-1/4 inches. Email Valohna with your customization requests. 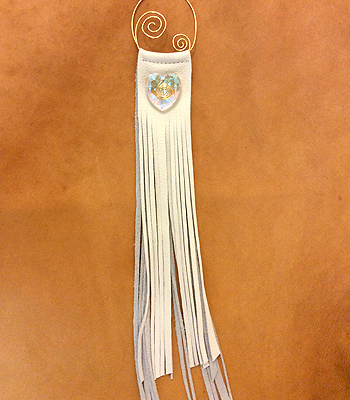 The Tribe Sister Gratitude Hearts are presented on a simple chain with matching S hooks. And, as with all Tribe Gratitude Hearts, they each arrive tucked inside of a white organza bag with gratitude scroll. Plus, a ritual to share with your tribe upon putting them on. 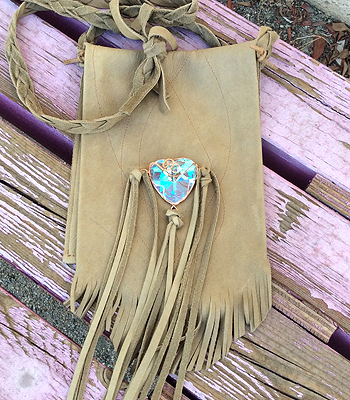 The tribe gratitude bag was created as an alternative to wearing the heart as a Necklace. 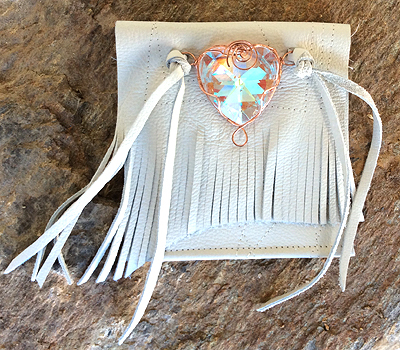 At tribe gratitude a little leather and glitz goes a long way with our deer skin leather bag that features a simple wired crystal heart secured to the lid of the purse with knotted laces. hand cut long fringe and a beautiful braided strap are part of the design to make this bag a beautiful addition to your wardrobe. It is featured here in our mocha colored deerskin leather that has a vintage look. The tribe gratitude bag is a beautiful way to inspire others in an unexpected way while carrying around your everyday necessities. Our little wish bag is small but mighty. Measuring 6 “x 6” and made from white leather, top stitched with our own sacred geometry and then teamed with our large gratitude heart. We created the Tribe Gratitude Heart Wish Bag for personal ceremonies, special events or just as a sacred place to put your wishes in. Each bag is designed with our intention to help you on your personal journey and every Wish Bag comes with a secret gift tucked inside from Valohna to brighten your day. The Tribe Gratitude Dream Catcher is our version of a traditional item interpreted in a new way. Our dream catcher is adorned with our smaller size gratitude heart and wire wrapped with our signature gratitude spiral. Stitched in white and made out of cow hide that is hand fringed by our design team in our studio. This little lovely will light up your room, throw rainbows and inspire your soul to dream.